International Champions Cup 2018 has finally confirmed to take place in North America (USA), Europe, and Singapore. In 2018 ICC, the top-ranked football teams will play against each other this summer. It is scheduled to take place from July 20 to August 12, 2018. The official authority has distributed the rights to different broadcast media partners worldwide. The official broadcasters in the United States are Channel FOX (English) and ESPN Deportes (Spanish). They will cover the live matches. In the United Kingdom, it will be done by BSkyB. Sky Sports will telecast the whole tournament to England’s subscribers. It will show all seventeen live matches from July to August. Below, on this page, we have a complete list of Broadcasting TV network country wise. At first, Channel+ and TV3 were given the rights just to cover the USA matches in Spain. But, later on, the broadcasting rights of China and Australian tournament were also provided to the same media. BeIN Sports will do the task in France, North Africa, and the Middle East. A Sub-Saharan subscribe can watch games at Star Time Network. Check: International Champions Cup 2018 Schedule. In India, the fans can enjoy the same at Star India while rest of the Asian audience like Pakistan, Sri Lanka, and Bangladesh will be able to catch live updates on Star Sports Network. 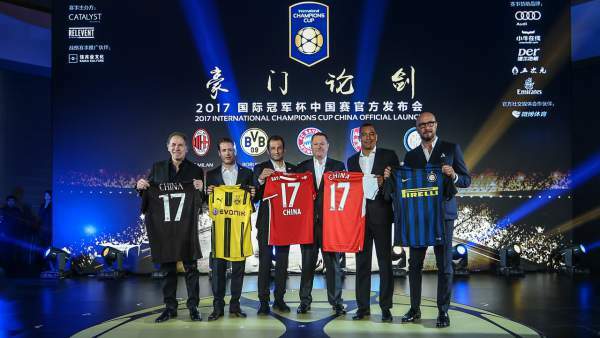 International Champions Cup may not be one of the most-aged tournaments, but its popularity is very high. You would also be able to watch online if your country doesn’t offer you on a TV channel. All of Chelsea’s games will be broadcast live on Chelsea TV. All of Liverpool’s games will be broadcast live on LFC TV. All of Manchester United’s games will be broadcast live on MUFC TV. Both of Tottenham’s fixtures will be broadcast live on Sky Sports 1. All of Leicester’s fixtures will also be broadcast live on Sky Sports 1, along with Manchester City’s clash with Borussia Dortmund. Stay tuned to TheReporterTimes.com for latest football news along with other sports updates across the globe.